Earl Bennett in the current home uniform. D. J. Moore in the current away uniform. Since the team's inception in 1920, the team's uniforms have received very little changes, with minor changes and various patches added. The classic look of the club's uniforms has given it the title of one of the best uniform sets in the league. The club has had few official logos throughout their history. The first was introduced in the early 1940s with a bear running with a football. The next logo featured a navy blue bear on top of a football. The team kept this until 1962, when the Bears trademark 'C' logo was first introduced by the team. The change in their logo from the black bear was due to the addition of logos on helmets, which pro football teams started adding in the late 1950s and early 1960s. Unlike some NFL franchises that have had many different looks over time, the Bears have kept the wishbone 'C' for over 40 years. The Bears 'C' logo first appeared on the helmets in 1962. (The "C" is in the same font as the "C" long worn on the Cincinnati Reds' baseball caps, as well as very closely resembling and likely copying the University of Chicago Maroons "C" logo introduced in 1898). The logo changed from white to a white-bordered orange logo eleven years later, and has remained unchanged ever since. In 1974, the team decided to keep the same white 'C' logo but to change the color of it from white to orange with a white trim. This is the current logo to this date; however, the club has experimented with some alternative logos throughout the past decade, including a navy blue bear inside of the orange wishbone 'C', introduced in 1995, and an orange bear head, introduced in 1999. In 1920 the team introduced the official team uniforms containing brown and blue stripes. This design of vertical stripes was a popular trend for football jerseys of the 1920s. The stripes were made up of strips of canvas that helped players grip the football. This was necessary because the standard football then in use was slightly fatter, rounder, and more difficult to handle than a modern football. The players' jersey number was displayed only on the back. In the 1930s, the franchise's team uniform underwent some substantial alterations. After many subtle and not-so-subtle changes, by 1933 the Bears donned all-orange jerseys with navy numbers and matching navy blue helmets. George Halas, by all accounts, adopted the navy blue and orange colors in honor of those of his alma mater, the University of Illinois. The team experimented with all orange uniforms during the decade, which was booed by the New York crowd during a game against the New York Giants for being "loud". In 1936, they modified this design into "an early version of psychedelia" by adding three orange stripes to their helmets, changing the color of the jerseys from orange to white, complementing the new white jerseys with fourteen navy and orange alternating stripes on the sleeves, and introducing socks with a similar striped pattern extending from ankle to knee. Due to poor response from the fans and the media, this design lasted only one season. In 1935, the Bears introduced an orange jersey with black arm stripes. Striping on the socks were added 5 years later. By 1949, the team was wearing the familiar navy blue shirts with white, rounded numbers. In 1956, the team added "TV numbers" to the sleeves. By 1957 the NFL, in part for easier television viewing, ordered home teams to wear dark, primary-colored jerseys and road teams white; the Bears' white jersey featured blue numerals with orange trim, and the three parallel sleeve stripes, the top and bottom blue and the middle orange. By 1960 the team's home jerseys had added orange trim to the round white numerals (which became slightly smaller); the blue socks gained white borders to the orange stripes. In 1961 the orange sleeve stripes were given white borders. The Bears added the initials GSH to the left sleeve of their jerseys after the October 31, 1983 passing of George Halas. In 1970, the Bears added names to the back to the players jersey. For decades, the team was known as the only NFL team to wear jersey numbers that were not the traditional block-style numbers. Although a handful of other NFL teams such as the early-1960s Pittsburgh Steelers, and the Houston Oilers during their early AFL days experimented with rounder jersey numbers, by the mid-1960s the Bears were the only team left to continue wearing rounded jersey numbers, though on a few occasions in 1971 and 1972 the team appeared in jerseys with plain block numerals. Since the mid-1990s, however, several teams have shifted away from the block numbers in favor of numbers that match a specific team font (e.g. Denver Broncos, Baltimore Ravens, Philadelphia Eagles, etc.) or in the case of the Pittsburgh Steelers, match the jersey number font with the helmet numbers while otherwise leaving the jersey design alone. In 2002, the Bears' blue became slightly darker in order "to achieve standardization among teams.". In 2012, the Bears received minor changes to the uniform after Nike took over as the official uniform supplier, with the numbers on the sleeve moved to the shoulder pads, and the GSH was enlarged. The Bears' pants have substantially remained the same throughout, with blue pants having orange and white stripes, as well as white pants with blue and orange stripes. The team normally wears their blue pants with their away jerseys, and white pants at home. The addition of navy blue pants as a part of the road kit came in 1984. For a few games in the 1930s the Bears wore a combination of orange jerseys and orange pants. The socks on the home uniforms are blue with orange stripes, resembling that of the stripes on the jersey, with the road uniform having alternating blue and orange stripes on white socks. The Bears' 2000 campaign was the first year in which the Bears returned to black shoes; they were previously worn from 1990–1992 and before 1974. They returned to white shoes in 2014. During the Bears' 2010 season, the team wore a #99 sticker on the back of their helmets to mourn the death of Gaines Adams, as well as wearing a #34 patch in 1999 to honor Walter Payton, who died that year. In their 1991 year, the team wore a #91 patch in honor of rookie Fred Washington, who died in a car accident, along with a #50 patch in 1992, in which they paid tribute to Mike Singletary, who retired that year. In 2001, the Bears wore a "Salute to Soldier Field" patch in honor of their stadium Soldier Field, which began its reconstruction that year. During the 1994 season, the Bears – with most of the other NFL franchises – introduced throwback uniforms to be worn in the honor of the NFL's 75th Anniversary. These jerseys, with brown and blue stripes, resemble the original uniforms worn by the team in the 1920s, which came along with brown pants, as well as blank blue helmets. On October 7, 2002 the Bears wore navy blue pants with their navy blue home jerseys for the first time, and lost at home to Green Bay before a national Monday Night Football audience. The Bears then wore the all-blue combination again until the 2006 regular season finale against the Packers, also a loss, on December 31. The Bears donned their all-blue uniforms again against the Packers on October 20, 2016 en route to a 26–10 loss. Also, the Bears wore all-white uniforms during their final two road games in the 2006 season, and for all of the 2008 season. On November 13, 2005 and October 29, 2006 (both times in games against the San Francisco 49ers), the Bears introduced an orange alternate home jersey. The orange swaps roles with the navy blue on this alternate jersey, as it becomes the dominant color while the navy complements. The Bears also donned the orange jerseys on October 28, 2007 against the Detroit Lions, a game that they lost 16-7. The Bears again wore the orange jerseys for the fourth consecutive year on October 19, 2008 when they hosted the Minnesota Vikings. The Bears previously wore orange jerseys as part of a throwback uniform in a Thanksgiving Day game at the Dallas Cowboys in 2004. 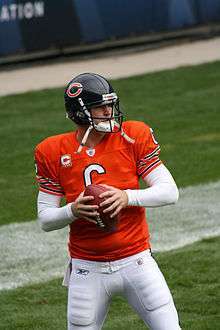 Since then, the Bears frequently wore their orange uniforms against their divisional rivals. For the 2010 season, the Bears introduced throwbacks representing the original Monsters of the Midway of the 1940s. They wore the uniforms against the Green Bay Packers on September 27, 2010 and against the Vikings on November 14 later that season. Both of those games were wins for the Bears. For the 2005–07 and 2010 home openers, the team wore the white jerseys with the navy blue pants, and is 4–0 in these games, beating the Lions in 2005, 2006, and 2010, and beating the Kansas City Chiefs in 2007. In 2012, the Bears announced that they will wear their 1940s alternates from 2010 against the Packers and Carolina Panthers. For unknown reasons, the video game Madden NFL 13 has the team wearing their away jerseys orange pants, though the team has never worn the combination. The Bears have retired fourteen uniform numbers, which is the most in the NFL, and ranks fourth behind the NBA's Boston Celtics (21), MLB's New York Yankees (20), and NHL's Montreal Canadiens (15) for the most in North American professional sports. Unofficial team mascot "Bearman" and "Honey Bear"
Before the 2003 season, the team had two unofficial mascots named "Rocky" and "Bearman". "Rocky" was a man who donned a #1 Bears jersey, carried a megaphone, and started chants all over Soldier Field during the 1970s, 1980s and early 1990s, in a fashion similar to Fireman Ed. There is no known source of who "Rocky" was, and presumably currently lives in Northwestern Indiana. 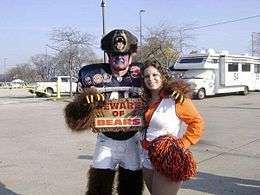 Don Wachter, also known as "Bearman", is a season ticket holder who decided in 1995 that he could also assist the team by cheerleading, similar to Rocky. The club allowed him to run across the field with a large Bears flag during player introductions and each team score (a role currently done by the Bears 4th Phase and Bears captains). In 1996, he donned his "costume" of face paint, bear head and arms, and a number 46 jersey. "Bearman" was forced to stop wearing his costume with the introduction of Staley Da Bear in 2003; however, in 2005 Wachter was allowed in costume again. "Staley Da Bear" is an anthropomorphic bear with a customized #00 jersey, with blue and orange eyes, synonymous with the team's main colors. His name is eponymous to corn processing company A. E. Staley, who originally founded the Bears' franchise in 1919. Like Rocky and Bearman, he entertains Bears fans, but like other NFL mascots, and mascots in general, Staley also makes various visits to charity events, parties, Chicago Rush AFL games, and other Bears-related events, as well as taking part in various games with his "furballs" against youth football teams at halftime. The team also formerly had their own cheerleading squad called the Chicago Honey Bears. However, Bears owner Virginia Halas McCaskey terminated them after the 1985 season. The squad's uniforms have changed 3 times: from 1977–1979 was a white bodysuit with navy blue sleeves, from 1980–1984 was also a white bodysuit, but with orange sleeves and the navy was moved to the trim, and in the squad's final season in 1985, the uniform was redesigned with an orange sequin vest. ↑ The Bears wore their 1940s throwbacks in 2010, 2012, 2013 and 2014. ↑ Neveau, James (2013-09-12). "Bears to Wear 1940's Throwback Jerseys Sunday". WMAQ-TV. Retrieved 2013-09-24. ↑ "Jay Mohr: Breaking down the best and worst NFL uniforms". Sports Illustrated. 2005-11-09. Retrieved 9 November 2005. ↑ Mayer, Larry (2012-08-29). "Bears ranked as top NFL uniform". Chicago bears. Retrieved 2012-12-21. ↑ "History of the Chicago Bears Logo". Chicago Bears. Archived from the original on 20 May 2005. Retrieved 1 August 2005. 1 2 "History of the Chicago Bears Uniform". Chicago Bears. Archived from the original on 2010-08-11. Retrieved 2012-07-06. ↑ "Evolution of the Bears Colors". National Football League. 2012-09-13. Retrieved 2012-12-21. ↑ "History of the Chicago Bears Uniform". Chicago Bears. Retrieved 1 August 2005. ↑ "New uniforms still sport same tradition". Chicagobears.com. Retrieved 2012-07-06. ↑ "Nike unveils brand new NFL uniforms". Chicagobears.com. Archived from the original on 2012-04-07. Retrieved 2012-07-06. ↑ "NFL special patches for 2010". Ben Maller. 2010-09-08. Retrieved 2012-07-06. ↑ "Chicago Bears Memorial Logo – Walter Payton – 1999". Chicagosportposter.com. Retrieved 2012-07-06. ↑ "BEARS UNVEIL ALL BLUE 'COLOR RUSH' UNIFORMS". CSN Chicago. 2016-09-13. Retrieved 2016-10-23. ↑ "Bears to wear 1940s throwback uniforms". Chicagobears.com. 2010-04-20. Retrieved 2012-07-06. ↑ "Will Bears wear orange jerseys this season?". Chicagobears.com. 2012-04-20. Archived from the original on 2012-05-29. Retrieved 2012-07-06. ↑ Mayer, Larry. "What color jerseys will Bears wear Sunday?". Chicago Bears. Retrieved 2012-12-21. ↑ "Rocky". Bearshistory.com. Retrieved 3 May 2006. ↑ "Bearman". Bearshistory.com. Retrieved 1 May 2006. ↑ "Roster". Chicago Bears. Retrieved 2012-07-06. ↑ "Staley crashes Bears holiday party". Chicagobears.com. 2008-12-29. Retrieved 2012-07-06. ↑ "Halloween is fun for Bears too". Chicagobears.com. 2009-11-06. Retrieved 2012-07-06. ↑ "Furballs foiled again". Chicagobears.com. 2009-12-30. Retrieved 2012-07-06. ↑ "Staley, friends fall to youth team". Chicagobears.com. 2009-01-16. Retrieved 2012-07-06. ↑ Taylor, Roy. "The Honey Bears and Chicago Bears Mascots". Bearshistory.com. Retrieved 2012-07-06. ↑ "Chicago Honey Bears.net". Chicago Honey Bears.net. Retrieved 2012-07-06.